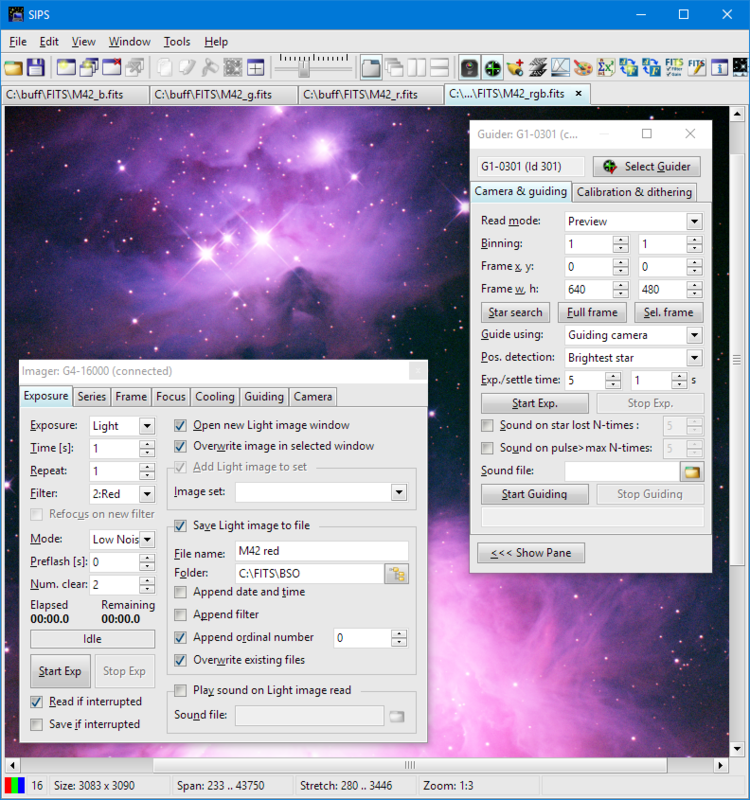 Processing images from large sensors and wide-field telescopes cannot be done without powerful software running on powerful computers. 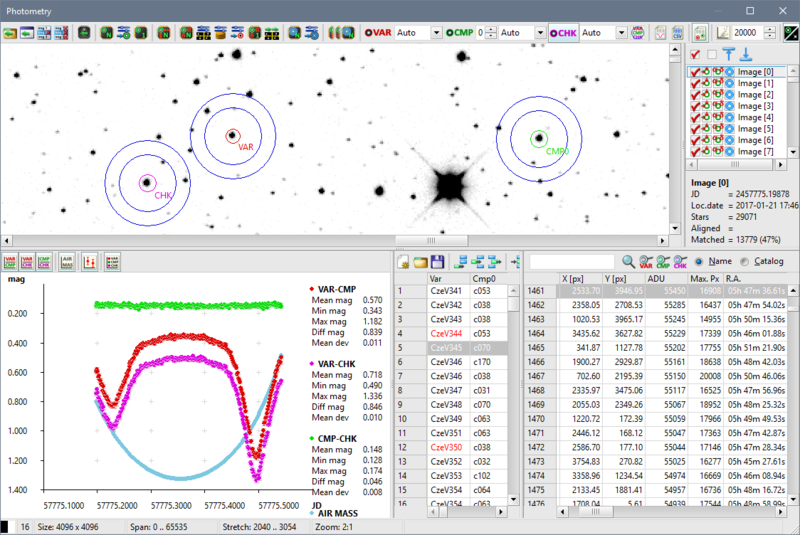 The SIPS software and particularly its Photometry tool is designed to allow semi-automated processing of large number of hi-resolution images and saving light curves of all stars of interest within the field of view. However, the SIPS software package functionality is much wider than photometry processing. In fact, the software was originally designed to handle cameras and control image acquisition (from sub-frame, binning and filter wheel control to FITS header definitions and file handling). Downloaded images have to be displayed and examined, so functions for image stretching (including non-linear gamma curve stretch) and zooming become part of SIPS. Functions for image calibration were added as well as mathematical operations for calibration file creation (mean, median, offset, …), followed by other tools including image matching and stacking, image blinking, image profiles etc. Also control of other hardware devices were included, like telescope mounts, focusers, observatory dome and roof controllers etc. Now SIPS is a powerful package capable to control whole observation and process acquired images. However, the image processing functions include mainly research-related algorithms (astrometry, photometry), not the processing of aesthetical astro-photography images, which can be handled much better by other software packages. Remember, the first ‘S’ in the SIPS abbreviation means Scientific. SIPS is a free software running on Windows operating systems. It is available in both 32-bit and 64-bit version. The 64-bit version requires 64-bit Windows to run (32-bit version seamlessly runs on both 32-bit and 64-bit Windows, of course) and also requires all used drivers to be 64-bit! Keep this on mind when trying to use some ASCOM camera or telescope driver, as the vast majority of device vendors provide only 32-bit drivers simply because all astronomy software remains 32-bit only. The key feature of 64-bit SIPS is the ability to use more than 4GB of memory, a really welcome capability when it is necessary to process hundreds of multi-megapixel images at once. SIPS can be downloaded as installable package or portable ZIP archive (a package of EXE, DLL and INI files). Please note the portable package can be run from any folder without installation, but it requires Microsoft Visual C++ 2015 runtime libraries (visit the Microsoft web site for download). Also please note the Visual C++ 2015 librarieas are necessary beginning with SIPS version 3.4.1, previous SIPS versions used Visual C++ 2008 libraries. The SIPS package always contains CHM documentation, thoroughly describing basic concepts, handling of images and images sets as well as operation of all tools included into SIPS.